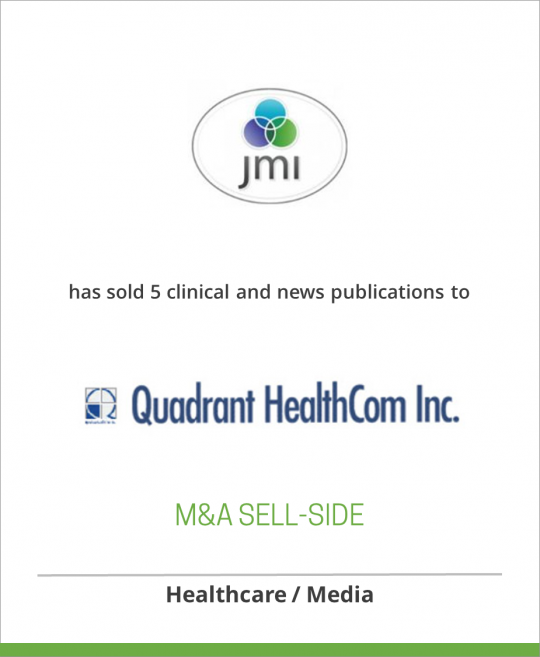 Jobson Medical Information has sold 5 clinical and news publications to Quadrant HealthCom, Inc.
Jobson Medical Information, an affiliate of The Wicks Group of Companies, LLC, is a leading specialty healthcare communications, publishing, and medical education company. The publications involved in the purchase are Clinician Reviews, Womens Health in Primary Care, Neurology Reviews, Neuropsychiatry Reviews, and Pulmonary Reviews. Jobson Medical Information produces a broad range of publications, educational programs, enduring educational materials, live events, symposia and websites that reach, teach and influence over one million healthcare professionals every month. Quadrant HealthCom Inc.’s journal portfolio will now contain 13 medical publications reaching an audience of well over 500,000 physicians, nurse practitioners and physician assistants each month. Quadrant’s expansion into more medical specialties creates a broad spectrum of advertising and educational program opportunities in the primary care, neurology, psychiatry, orthopedic, dermatology, neurology, pulmonary, emergency medicine, urgent care, women’s health, nurse practitioner/physician assistant and federal markets. Sold to Quadrant HealthCom, Inc.